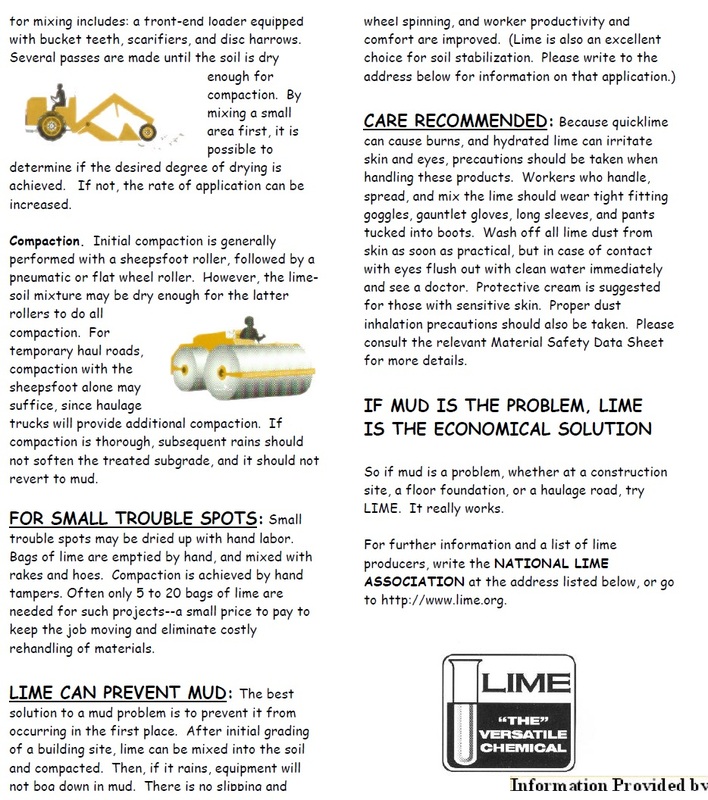 We firmly believe in the proper use of hydrated lime or Quicklime as a method to stabilize your ground for strength if either the subsoil is not a desirable material to build on or if the material your bringing in as a compactable material has to much moisture in it to allow for the compaction to take place. 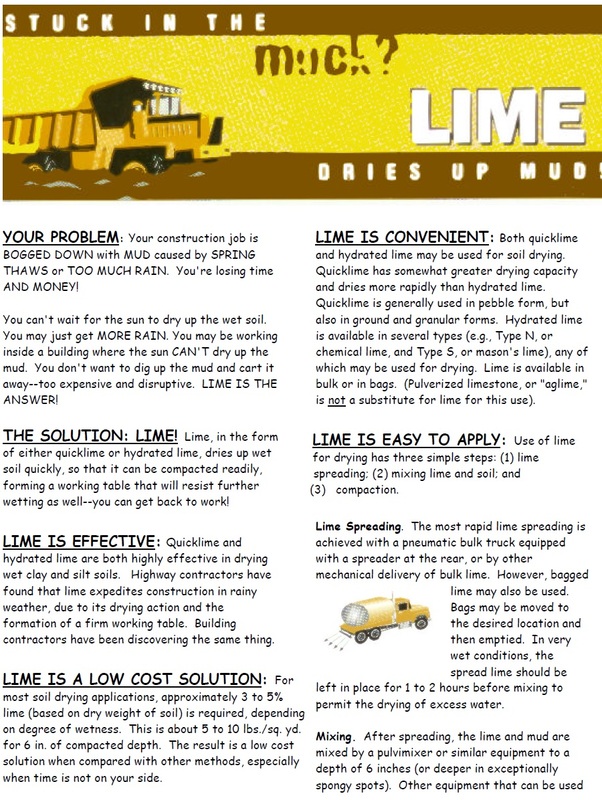 Hydrated lime will also dry out a muddy construction entrance or just about anything it comes in contact with. One of the great things about using a lime product is that its not just a temporary fix but instead will actually change the properties of the soil forever. Below you will find some further reading material on hydrated lime and its uses. U.S. for soil modification and stabilization. · Long-term durability over decades of service even under severe environmental conditions. These performance benefits translate into short- and long-term economic benefits. design can create more cost-effective design alternatives. than replace them, this use of lime will become even more important. mixing. 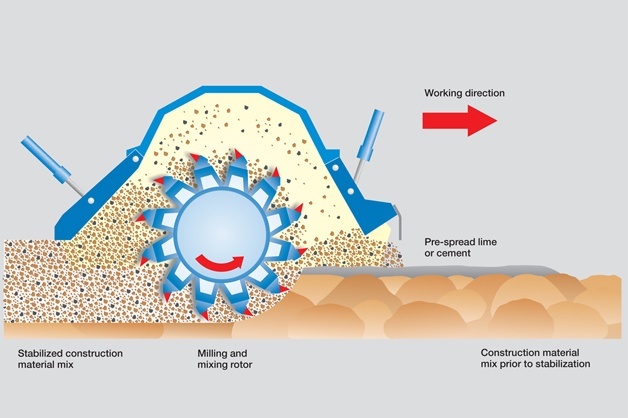 For maximum development of strength and durability, proper compaction is necessary. This entry was posted in 337-342-5600, abbeville, broussard, Bulk Material, calculator, Call Now, Clay, Compactable Dirt, Contractors, Delivery, Dirt, dirt hauling, dump truck, duson, Fill Dirt, Fill Dirt Delivered, Gravel, hauling, Home Owners, la, Lafayette, Limestone, Lowest Prices, materials, maurice, milton, new iberia, Overburden, rayne, Same Day, Sand, sand and gravel, Sandy Fill, scott, Select Dirt, Stone. Delivery to Builders, Topsoil, youngsville and tagged chemical stabilization, concrete slab, construction projects, Expansive clays, expansive subsoil, helps prevent water, high pH environment of the lime, high plasticity, holding capacity (drying), hydrated lime, impermeability, Improved stability, increase the stability, lime, Lime stabilization, load bearing capacity of the subgrade, Modification, modification and stabilization of soil, moisture barrier, Plasticity reduction, reducing the soils's expansive properties, Reduction in moisture, soil drying, soil improvement, soil modification, soil modification and stabilization, soil moisture content, stabilize buildings sites, stabilize road beds, subgrade stabilization, subgrade support, Swell reduction, The ability to construct a solid working platform, upgrade poor quality clay soils. Bookmark the permalink.